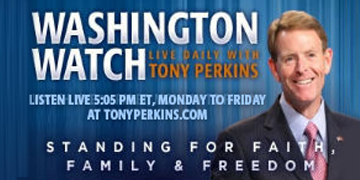 On Thursday's edition of "Washington Watch with Tony Perkins" Washington Watch producer, Russ Jones, guest hosts for Tony. Rep. Dave Brat (R-Va.) joins our guest host with the details on a new bill that will help veterans receive better healthcare. Rep. Brat will also give us an update on the state of our economy and unemployment rates. President of Judicial Watch, Tom Fitton, is here to highlight the 49 pages of State Department documents Judicial Watch recently released that show collaboration between George Soros’s representatives in Romania and the U.S. State Department. Also, president of Reaching America Derrick Hollie joins the program with his, and other black leaders’ response to Don Lemon’s recent statement that white men are the “biggest terror threat” facing America.